One of the risks inherent to window cleaning is the danger of suffering serious injury or even death from a fall. Working at height has always been a risky business, but for window cleaners some of that risk can now be mitigated through the use of ladderless window cleaning systems. These systems have been in development since the late 1990s but got a boost in the U.K. when new safety regulations were released in 2005. According to those regulations, all at height work must be done from the ground or other safe means whenever reasonably possible. With conventional window cleaning methods, the use of tap water and various cleaning agents created the need to for the technician to be within arm's length of the window in order to wipe away the residue remaining on the panes. This is because tap water, though safe for drinking, still contains minerals which leave a film on windows and attract more dirt. When windows are at height, ladders and other equipment are needed to clean them. 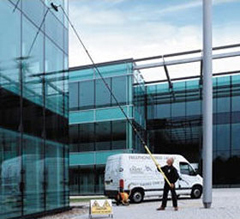 With a ladderless window cleaning system there is no need to be so close to the window being washed. This is due to the fact that pure water is used, eliminating the need for cleaning agents and the wiping down of the panes. The system works on the principle of absorption. Water absorbs dirt particles whenever it flows. The cleaner the water, the more dirt is absorbed until the water reaches a "saturation" point. The tap water used in conventional window cleaning is unable to absorb all the dirt from the windows, leaving a residue which must be wiped away by the operator. But when pure water is used it absorbs nearly all of the dirt particles and washes them away. A second pure water rinse assures that windows are perfectly clean and will air dry without streaks or spots. A typical ladderless window cleaning system employs a tank of water which has been purified through reverse osmosis. The water is then fed up through the operator's pole to a brush system, where it is discharged at a consistent flow rate as the brush is moved across the window and frame. As the water pulls away from the window it strives to return to its natural state of impurity, taking dirt particles with it. Hot water tends to work even better than cold. Ladderless window cleaning is ideal for domestic applications because it eliminates the need to have potentially damaging ladders leaning against the house. The discharge poses no threat to the garden below since no chemicals are used for cleaning. Privacy is also assured on the upper floors because the operator never leaves the ground. Most systems employ poles which can reach as high as 70 feet. Another benefit to ladderless window cleaning is speed and efficiency. It is much easier for an operator to pull out his pole and brush and get to work than it is to set up a ladder, climb and clean a window, then climb down and reset the ladder in a new position. The ladderless window cleaning system means quicker service and the potential to add more stops to a round. For window cleaning professionals, going ladderless is a win-win scenario. Cleaner windows, safer working conditions, and greater efficiency make for a much more profitable business.